Two weeks before the big day, Welsh Constable Evans is ready to be done planning for his wedding. Just as he’s unloading the last boxes into the new home he and his bride, Bronwen, have chosen, he runs into a teenager whose girlfriend has gone missing on Mt. Snowdon. Despite his apprehensions about getting involved in a new case, Evans cannot resist helping the worried hiker. A search yields no trace of the girl but does turn up a well-stocked bunker, complete with chains and handcuffs. Are the two related? And if so, where is the girl being held? When a series of clues is uncovered, Evans and the police begin to see that they are dealing with a clever but twisted mind. Then a second person vanishes and this time Evans knows the victim: Bronwen. He realizes the culprit’s vendetta might be a personal one and that the actual target might have been him all along. 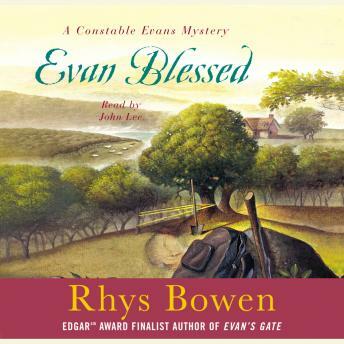 Award-winner Rhys Bowen, whose most recent Constable Evans novel, Evan’s Gate, was a finalist for the Edgar Award for best mystery novel of the year, delivers another charming and suspenseful cozy mystery set in beautiful Wales and starring fan favorite village constable Evan Evans.